Cisco caught in Lake Michigan. Image: Katie Steiger-Meister/USFWS. A native fish may be poised for a comeback in the Great Lakes with the help of an invasive species. Great Lakes cisco, also known as lake herring, are growing in number. Catch rates are increasing in recreational and commercial fisheries, said Kevin Donner, Little Traverse Bay Bands of Odawa Indians’ Great Lakes fisheries program manager. Twenty years ago, it would have been notable to catch a single cisco in a year in Lake Michigan. In the bay, they’re now pulled up by the netload. 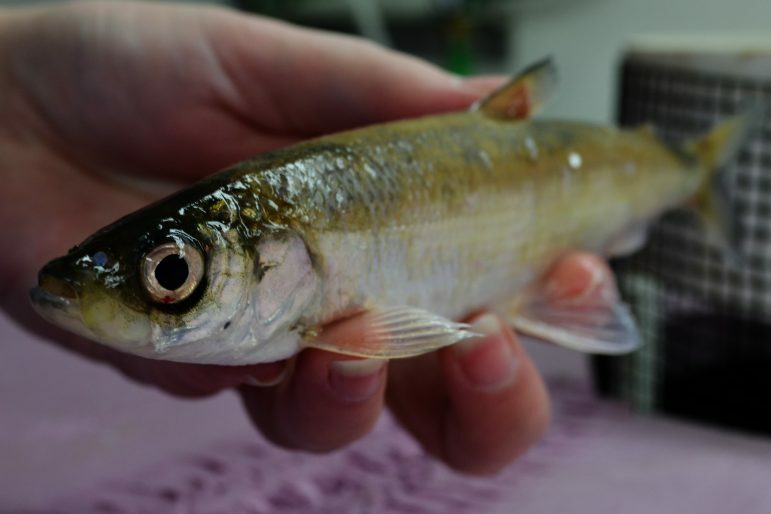 It’s a similar story in Chaumont Bay, Lake Ontario, where researchers have caught thousands of cisco in recent years, said Curt Karboski, a biologist with the Lower Great Lakes Fish and Wildlife Conservation Office in Amherst, New York. Cisco typically grow about 12 to 15 inches long and at one point supported one of the largest commercial fisheries in the region. They disappeared from much of the basin around the 1950s, Donner said. Now it looks like the stage has been set for their return–by an unlikely ally. Invasive quagga mussels have depleted nutrients in the lakes, said Matt Herbert, an aquatic ecologist with the Nature Conservancy. Cisco do well in low-nutrient environments, unlike competing species like the invasive alewife. That gives cisco space to thrive. Now that the quagga has done its part, the cisco are on a roll. Other than accidentally introducing the invasive species, humans can’t take credit for the comeback, according to Donner. But the field is now readied for researchers to make a bigger impact. Donner is working with the Little Traverse Bay Bands of Odawa Indians to restore the cisco in Little Traverse Bay, in northwest Lake Michigan. They’ve been harvesting, rearing and stocking cisco since 2013. And their success has him excited. “We’re almost seeing exponential changes every single year,” Donner said. Another population of a different type of cisco seems to be resurgent further south near Ludington, Michigan, he said. Nearby Grand Traverse Bay is seeing a boom as well, Herbert said. The bay is home to the only known cisco spawning reef in the lake, though others are sure to exist. There also have been good signs in Lake Huron, Stott said. But Lake Superior is the only lake to still boast a robust population. Overfishing, invasive species and habitat degradation led to the cisco crash, Herbert said. Lake Erie once boasted one of the largest cisco populations of the lakes, but those populations were hit especially hard and have since been lost entirely. Within a decade, the cisco fishery in the Great Lakes fell from bringing in millions of pounds per year to zero, Donner said. This could be the start of a resurgence. There was some surprise for a few years when the cisco boom wasn’t happening as quickly as researchers had expected, Herbert said. He blames the slow start on the low number of cisco to begin with. Ecologists have been watching the ecosystem become more cisco-friendly for some time. “The lake is probably more like it was historically when these fishes thrived,” Herbert said. But not all species that experience a boom can turn it into long-term success. “The question is, how quickly are they going to expand and are they going to become a major part of the food web?” Herbert said. Karboski worries that the cisco he studies in Lake Ontario could be one of these boom-and-bust stories. Recent surveys have yielded “huge catches,” he said, but those catches are made up of fish from only a few stocking years and aren’t good indicators of the overall population. He would like to see the age distribution even out before he can feel comfortable that the cisco are on track. Karboski and Donner study two different populations of cisco in separate lakes, miles apart. But both have found a similar streak of opportunism in the fish. Both populations eat large amounts of spiny water fleas–a large, invasive zooplankton with large spines that keep many fish from digesting them. That includes other foragers like alewives. But that doesn’t appear to include these cisco, Karboski said. The cisco in Little Traverse Bay eat smaller fish, a practice that is rare among other populations, Donner said. Their diet isn’t the only thing that sets them apart. Cisco in the bay grow upwards of 24 inches long and weigh up to 8 pounds, Donner said. That’s twice the length of a typical cisco, like those found in the booming population near Ludington. They also reproduce with a fervor. Comparing different sizes of cisco caught around Little Traverse Bay. Image: Kevin Donner. Historically, multiple types of cisco have existed in the Great Lakes. Those in Traverse Bay are distinct from those reappearing around Lake Michigan, Stott said. She is surveying and describing the genetic diversity of populations around the Great Lakes region. 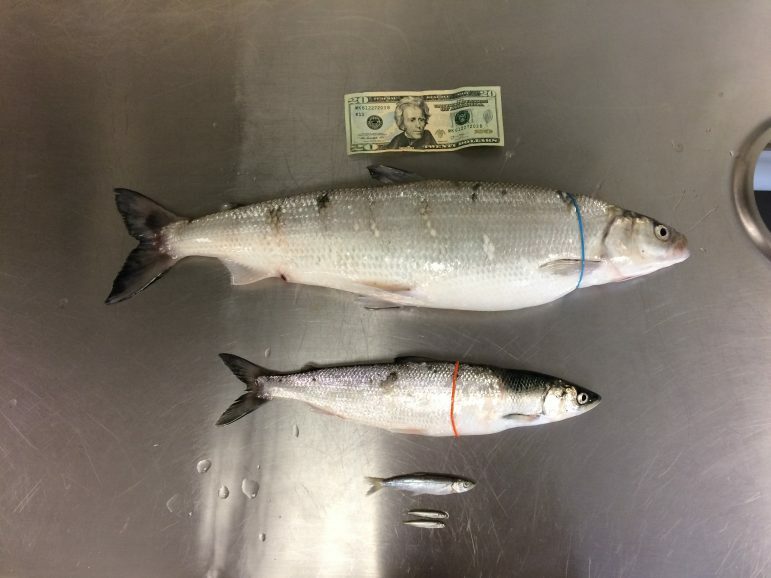 Cisco is a forage fish, typically eaten by predators like lake trout, walleye and northern pike, according to the University of Wisconsin Sea Grant Institute. Herbert believes stabilizing the cisco could benefit Great Lakes ecosystems. “The more diverse the forage population, the more resilient it will be,” Herbert said. Resilient forage populations can help support predatory fish populations, both of which can benefit recreational and commercial fishing, Herbert said. Reestablishing the cisco helps the fish upon which the Great Lakes’ economy relies. Recreational cisco fisheries are already building in places they hadn’t been before, said Donner, who has had luck fishing for them in Charlevoix, Michigan. An added bonus: Cisco happen to be delicious, he said. Will King salmon eat them?